Another beautiful day here in Pang...although this picture looks like it was taken around dusk, I actually snapped it in the afternoon. Reality is finally setting in...darkness. I've decided that I need to shell out the money for one of those light alarm-clocks...I've never been great for getting up in the morning. Gotta say, though, that the light which is slipping away during the day is showing up in green smears every night. I just came back from checking out the sky and it looks like some sort of crazy screen-saver. Tonight the Lights are running parallel to the fjord, shooting up the pass. Saa-weet! Right now it's about the only time I use my Canada Goose jacket...I'm still trying to avoid using it until it's really cold, but it's easy to throw on at night. You know, I never thought I would wish for fewer lights up here. I mean, I'm used to the glare of cities. Up here, to really enjoy the huge expanse of...hmm...breathless openness, it would be better to remove all the lights in these rows of government units. Perhaps I'll get a chance to do some winter camping out on the land and surround myself with stars. I plan to do something like that in the deserts of Jordan in a few years, but I want to experience Canada's desert first...oh, and for those of you who might think that's a negative thing, don't mistake 'desert' for 'dead'. Funny thing. It was after 11 the last time I stuck my head out the door and there were a few kids hanging out. Just walking around. Freezing. Asking me why I wasn't out smoking. Why I didn't smoke at all. These 12-year olds were really quite confused...kinda sad. So, yesterday was the big Vote, and the results are in: over 70% of the hamlet of Pangnirtung have decided that alcohol should not be legalized. I think there was a collective sigh of relief floating through the lungs of everyone I know this morning; it has certainly quelled my fears! 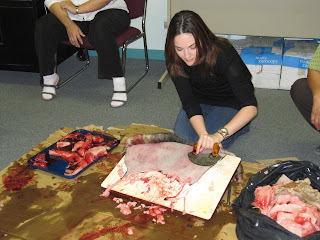 A few weeks ago I mentioned my seal dissection and the delicacies which followed. Tonight I'll move on to the skin. Is that the right word? It's not a hide, is it? A pelt? Not really sure...let's just say it's a skin. After chowin' down on the meat and berries, it was time to start scraping off the blubber. Check me out! At first it was pretty crazy...I couldn't really do anything without an audible wince from the class. I think it had something to do with the fact that it was the first time I had picked up such a sharp tool as well as how strange it looked to have a left-handed southerner slicing chunks in the opposite direction. Typical reaction from a right-handed expert. It starts like this...the blubber is at least 10-15 centimeters thick, so all but about an inch is sliced off. The elevated board is really important to complete this whole task successfully. Next, the skin is flattened against the board and scraped; though I finally mastered it (kinda), the rolling at the top was something I needed to get used to...it's heavier than I thought it would be, but it needs to be taut to get everything right. The blubber used to be used in a kudluk, but these days some sort of coleman device is a bit more common. Here you can see it piled up in the garbage bag. The blue tray is still holding all the meat we have yet to eat...bunches! When boiled, it's awesome...the broth is unbelievable! If I can figure out the whole video thing, I have a few great ones to show off my mad skillz. After two months, the seal - and all its pieces - has been the center of my gastronomical experience; Char, after all, tastes surprisingly like salmon. Muktuk was a bit off course...whales'n'seals, whales'n'seals...but with the latter all I have left to conquer is a couple of internal organs. Once I get there, I think it'll be time to change back to a strictly meat diet...well, sprinkled with a bit of produce and carbs here an there. Hello Tara, my name is Levon Sevunts, I'm a producer with Radio Canada International (CBC International in Montreal). I'm working on organizing a very exciting international co-production with media outlets from all the circumpolar countries on the issues of climate change and the impact on the Arctic and its people. But a big part of the project is to create a space where people of the Arctic in all these countries can tell their own stories. 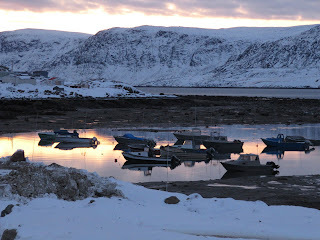 And so I'm looking for different people - Innuit and complete newbes to the Arctic - who would be willing to blog about their lives in the Arctic for this project. 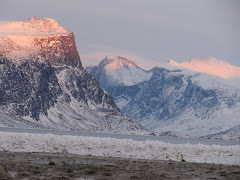 I really enjoyed your blog and I'm hoping that you'd consider contributing to our Arctic blog once it's up and running (probably by January).